Have you ever wanted to step into a police officer’s shoes and make a snap, life-and-death decision? Do you have what it takes to properly remove an injured person from a mangled vehicle and then perform CPR? Well, here’s your chance to get a glimpse of yourself in those scenarios. The Emergency Medical Services and Criminal Justice programs at Kellogg Community College invite the public to an open house from 4 to 8 p.m. Aug. 13 in the Lane-Thomas Building on the North Avenue campus in Battle Creek. The interactive open house, which will feature live demonstrations of medical and police training equipment, will give community members and prospective students a deeper understanding of the curriculum at KCC that is used to train future police officers, paramedics, corrections officers, emergency medical technicians and other personnel. “We hope people from across the region will visit with us, try some of our equipment and get a close look at what it takes to become a first responder or law enforcement official,” said Chet Dalski, director of the EMS Program. Room 102: Medical first responder extrication demonstration. Can you safely extricate a patient? Try removing individuals from a vehicle using a Kendrick Extrication Device. Participants will experience how to properly apply and move a patient safely from a vehicle. Room 106: Simulation lab. How real does training get? 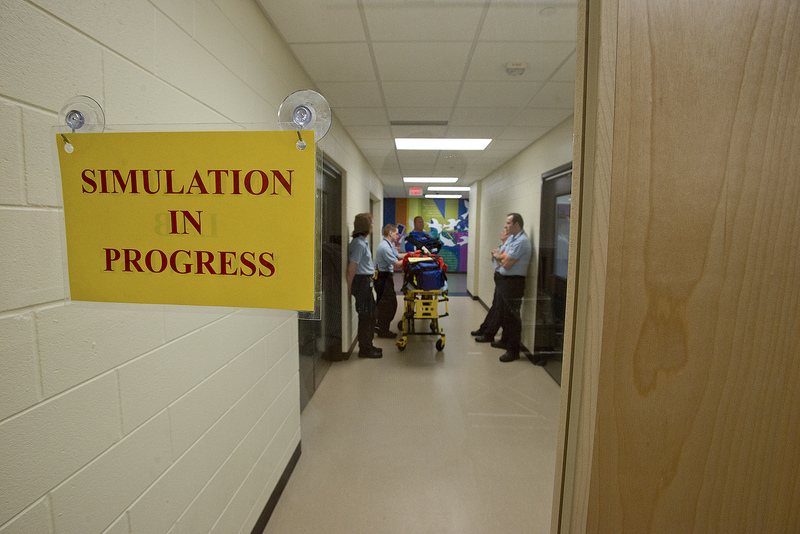 In this lab, instructors will show how the simulation lab recreates actual calls. Various high fidelity manikins will be used to recreate medical emergencies. The manikins talk, blink, breathe and allow students to learn through practice. Participants will have an opportunity to interact with the manikins and simulation equipment to learn what it takes to respond to a call. Room 201 hallway: AHA training center and clinical experiences. How well can you do CPR? In this classroom, an instructor will answer questions about EMS clinical experiences and KCC’s American Heart Association training center. Participants can use a Laerdal Skillmeter Anne to see how well they can do CPR. Room 203: Basic EMT and critical care. How much carbon dioxide do you exhale? In this classroom, an instructor will answer questions on the Basic EMT program, which is the starting point for working on an ambulance. Participants will see the latest technology in end-tidal CO2 monitoring and practice splinting broken bones. Room 204: Paramedic lab. Could you save a life? In this invasive lab, participants will have an opportunity to intubate a manikin and ventilate using a bag-valve-mask. Room 205: EMS information. Ask any questions about the EMS programs, including how to enroll and what career options are available to graduates. Third Floor lobby: Light refreshments. Room 303: MILO shooting simulator. Could you make the right call as a police officer? KCC recently purchased a MILO simulation system, a series of interactive videos, computer-generated graphics and simulated weapons. The system trains students on judgment skills, verbalization skills and lethal and less lethal weapon use. Trainees are exposed to realistic life and death situations via interactive video scenarios. Room 305: Criminal Justice information. Ask any questions about the Criminal Justice programs, including how to enroll and what career options are available to graduates.